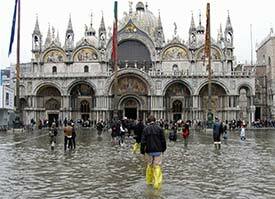 "The church in Venice, though, is somehing more than all things bright and beautiful. It is descended from Byzantium, by faith out of nationalism; and sometimes to its high ritual in the Basilica of St. Mark there is a tremendous sense of the Eastern past, marbled, hazed, and silken. St. Mark's itself is a barbaric building, like a great Mongolian pleasure pavilion, or a fortress in Turkestan: and sometimes there is a suggestion of rich barbarism to its services too, devout, reverent and beautiful though they are." 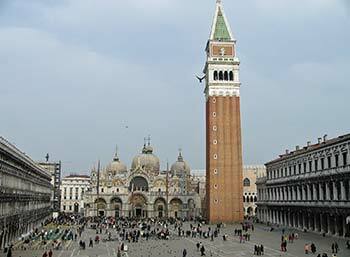 ABOVE: St. Mark's Basilica faces the Piazza San Marco, just behind the Campanile (bell tower) and next to the Doge's Palace. TOP INSET PHOTO: St. Mark, his retinue of angels, and a winged lion (click thumbnail for a larger image). If bones are barbaric (as they may seem if you're a relic-phobic Protestant), the Basilica's "rich barbarism" may be due, in part, to the reason for its existence. The Basilica was constructed as a home for the bones of St. Mark the Evangelist, whose remains were stolen from Alexandria, Egypt by two Venetian merchants who smuggled the saint's bones past Muslim customs officials by stuffing them into a barrel of pork in 828 AD. After 200 years or so in temporary quarters, the Evangelist's bones were moved to the new Basilica di San Marco (the third church on the site) in the 11th Century. Interestingly enough, the Basilica didn't become Venice's cathedral until 1807, after many hundreds of years as a chapel and state church under the authority of the Doges of the Venetian Republic. Several popes have served as Patriarch of Venice, most recently Pope John XXIII and Pope John Paul I. 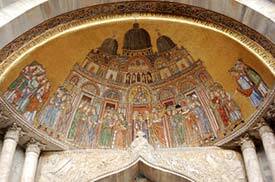 The official Basilica di San Marco Web site has more details on the church's history, art, and architecture. ABOVE: The main visitor entrance is on the Piazza side of the church; look for the crowd-control barriers and the stanchions with signs. Visiting hours can vary slightly by season; the sign in front of the Basilica will show current times. Check your bag or backpack at the Ateneo San Basso, a former church just around the corner and down the Calle San Basso from the Basilica's main entrance. (You'll need to do this anyway if you're carrying anything larger than a purse, and there's a 60-minute limit.) When you check your gear, you'll be given a plastic claim check that can be used to bypass the queue at the front of the Basilica. Join a tour. 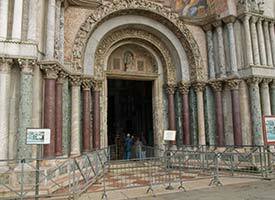 Book a sightseeing tour in advance through Viator, or look for freelance guides in front of the Basilica. "Pre-sightsee." Rick Steves has a PDF map of the Basilica on his Web site. You'll also find a Rick Steves audio tour in MPEG-4 (iTunes) format. 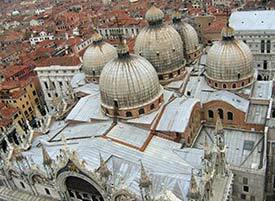 The Procuratoria in Venice has an official English-language Web site about the Basilica, with historical information, a 3D "Virtual Basilica" tour, a liturgical calendar, etc. 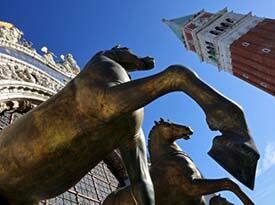 David Pedre took this photo from the Campanile di San Marco, which overlooks the Basilica and St. Mark's Square. The picture shows the Basilica's façade (at bottom) and its five domes. 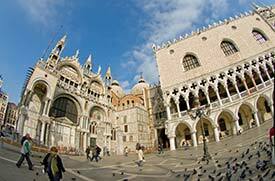 This fisheye view of the Basilica and the Doge's Palace (right) shows a drier Piazza and a flock of pigeons. These two photos (top by Luke Daniek, bottom by Gijs van Ouwerkerk) show two of the four Horses of St. Mark, a.k.a. the Quadriga. The horses on the Basilica's façade are replicas of the original quadriga, which is now exhibited inside the church. 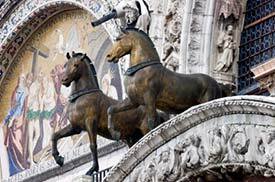 The gilded bronze horses are believed to be at least 1,700 years old; they were brought to Venice in 1204 during the Crusades. Amanda Lewis took this photo of a Byzantine mosaic. 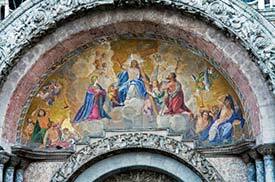 This detail of a mosaic above one of the Basilica's doorways was photographed by D.N. Davis. Top inset photo copyright © Luke Daniek.